As many of you will have seen, our WW1 History Trail has been in Platt Woods since the start of July, and we are thrilled to hear how many people both locals and from further afield have taken part. If you haven’t yet been up to the woods there is still time to take a look, full details of which are on our website www.plattmemorialhall/historytrail – or if you do not have the internet, the church has kindly provided a small number of trail maps and info sheets inside the entrance. We would be grateful if you could return these after you have been around. By now, you may have also started to see the commemorative plaques of men listed on our war memorial appearing around the parish outside the houses where they once lived. This will continue every other day until 10th November when we shall be collecting them all together and creating a ‘Garden of Remembrance’ at the hall gardens in time for the Armistice anniversary the following day. 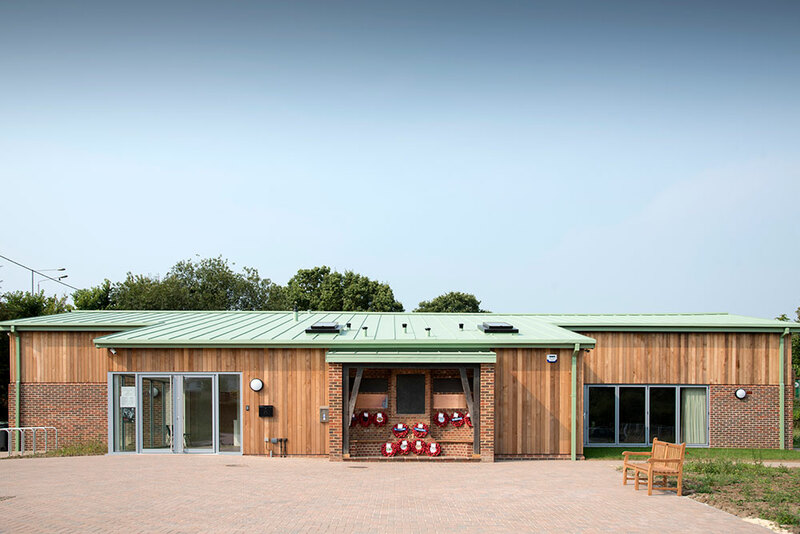 We are incredibly grateful to the homeowners and businesses who have allowed us to do this, we already know of several descendants of the men remembered who have been incredibly touched by the project. 1, Over the coming months, The Royal British Legion is leading the nation in saying Thank You to those who served and sacrificed during World War One and inviting families, community groups and individuals to do this in whatever way they think appropriate. We would like to invite you to the hall where we will be setting up a small photographic studio in the committee room where you will be able to have a professional portrait made holding something belonging to, or related to, a family member who served in World War One you would like to thank. This could be an old photograph, medals or an item of uniform etc. and the person does not necessarily have to be someone from the military, they could have been active on the home front such as a munitions worker, VAD nurse or land army girl. We would like this to become a historical record of the people living in our community 100 years after the guns fell silent and our country began the journey to what it is today. The studio will be set up to accommodate one or two individuals in each portrait, however, if you have more people in your family who would like to express their gratitude we would be happy to photograph each individually. We currently have two dates (with a third booked provisionally if demand requires it) of the evening of 19th October (from 7:30 pm) and the morning of the 20th (from 10 am.) For more ideas of the sort of thing you might like to bring along, and the basic details we would need for each person you are remembering, please see our 2014 project with the children of Platt School: www.plattmemorialhall.org/centenary-book There will be an opportunity to buy prints of each portrait for a small fee to cover production costs, and then hopefully, a commemorative book, which you will also be able to purchase. 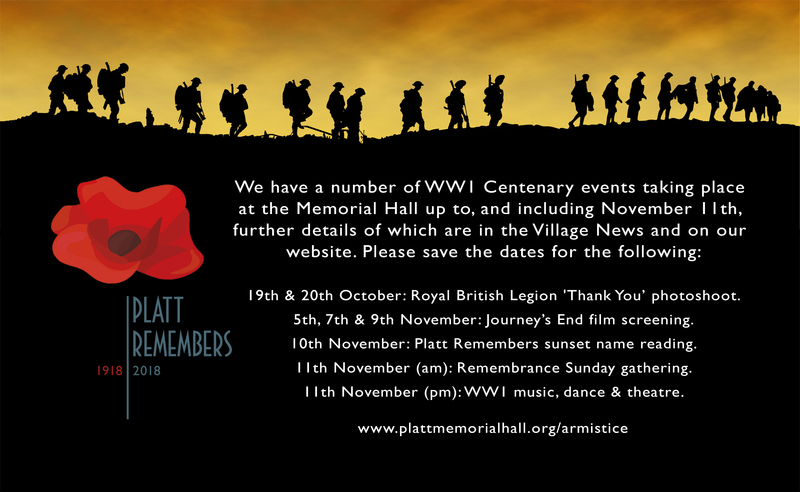 For further information and queries please contact Scott Wishart at scott@plattwarmemorial.org or on 886602. 2, In the week leading up to Remembrance Sunday we have been given permission from Lionsgate Films to show the film version of R.C. Sherriff’s play ‘Journeys End’ which stars (among others) Asa Butterfield, Sam Claflin, Paul Bettany, Stephen Graham and Toby Jones. Set in the trenches around the time of the German Spring Offensive began in March 1918 the film is a powerful (and reassuringly faithful) adaptation of the stage production first performed in 1928 that starred a young Laurence Olivier. We shall be screening the film over three nights (5th, 7th and 9th November) with booking information to be made available shortly on our website and in the next Village News. 3, Before sunset on 10 November we are inviting anyone in Platt who may be interested to take part in reading out the names of ALL the men and women from the parish who served in uniform during WW1. In this final year of the centenary, we thought it should be important to remember everyone whether they returned home or not. There are about 200 individuals, and depending on interest, we are hoping to assign ten names per-reader. Subject to the weather, the event will take place outside the hall on the Memorial Square, and afterwards you are invited to come inside and view an exhibition about Platt during WW1. 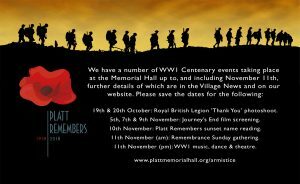 A comprehensive timetable of all events concerning the Remembrance Weekend will appear in the next village news (and on our website www.plattmemorialhall/armistice), however, for now, we would still be pleased to hear from anyone wishing to take part in our WW1 afternoon of entertainment on the 11th. So far we have had confirmation from a respectable number of our very talented locals/performing groups and the line up is already looking fantastic. This promises to be a very entertaining afternoon and there is still time to register your interest either at armistice@plattmemorialhall.org or 886602. In addition to all of this the dates of our regular monthly garden meetings will be September 15th and October 20th. If you would like to join us for an hour or two we would love you to join us from around 9.30am during which refreshments are served, this is not arduous work but a light hearted social gathering to keep our garden looking good. Whilst visiting the hall a few weeks ago I picked up an item of jewellery from the floor, if you have lost a piece whilst visiting the hall please give me a call.